Bridging The Gap Between People And Needs. 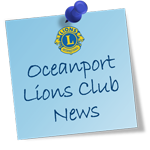 The Oceanport Lions Club has dedicated the talent of its members and the funds raised from its activities to promoting, for all the citizens of Oceanport, a spirit of community and cooperation; both in how it conducts its affairs and through its charitable donations to a multitude of organizations and individuals in Oceanport NJ. An update on what the Oceanport Lions Club is doing for you! Since 1952 the Oceanport Lions Club has been helping not only sight impaired individuals but they have contributed in many ways to Oceanport residents through community donations. Here are some exciting programs that may be of interest for you or someone you know. • The club has information for low vision individuals. • The club also does vision screening. • On November 16th the Oceanport Lions Club will make a donation to the Oceanport School System. • There are several organizations including the state of New Jersey that will assist you with sight friendly. devices including a talking books program. We can help you connect to the low vision services available. Since 2015 the Oceanport Lions Club has performed vision screenings on over a thousand students! All vision screenings are provided free of charge by volunteers of the Oceanport Lions Club. If you would like to learn more as to how the Oceanport Lions can help you or someone you know just contact them, they are here to help in any way they can. Contact John M. Bonforte Sr. at JohnSr@monmouthrubber.com or (908)489-9090. You can also visit their Facebook page @oceanportlionsclub and like it, this will help them get the word out!